These unique Chinese Wood Plaques are hand carved with Chinese auspicious symbols, such as Chinese dragon symbol, Chinese phoenix symbol, Chinese good fortune and wealth symbols, Chinese happiness symbol. Great Chinese home decor and housewarming gifts. 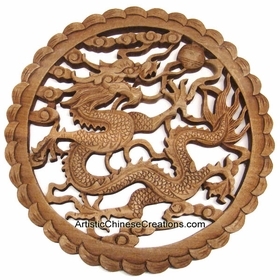 Please click on each Chinese wood carving - wall plaque below for detailed information. We offer Chinese dragon and phoenix wood plaques, Chinese good fortune and wealth wood plaques, Chinese fish and lotus wood plaques and more.